Is Laparoscopic Bariatric Surgery for You? Abdominal wall hernias are one of the most common surgical conditions. 27% of men and 3% of women will develop groin hernias over their lifetime. Other types of hernias: femoral, epigastric, umbilical, incisional, Spigelian, para-stomal and obturator. At the Association of South Bay Surgeons, we are dedicated to providing the highest quality care to patients diagnosed with breast cancer. In the U.S., breast cancer remains a leading cause of cancer deaths for women, only second to lung cancer. Robotic surgery, or robot-assisted surgery, allows doctors to perform many types of complex procedures with more precision, flexibility and control than is possible with conventional techniques. Initial treatment with lifestyle changes and weight loss as well as medication to reduce acid may resolve the symptoms. Patients who don't respond to these methods are often good candidates for surgical treatment of their GERD. Melanoma is one of the most lethal cancers known, particularly when it is discovered late. California, is particularly vulnerable for melanoma development. One of the hallmarks of melanoma is the finding of a changing, pigmented lesion. Thyroid cancer awareness! The incidence of thyroid cancer is rising faster than any other solid tumor in the United States. Thankfully, when caught and treated early, thyroid cancer is usually curable with appropriate surgery. Insulin resistance and Type 2 Diabetes Mellitus (T2DM) continue to be a major health threat in the US. It remains the 7th leading cause of death amongst adults. Though rare, gallbladder and bile duct cancers are difficult to treat. 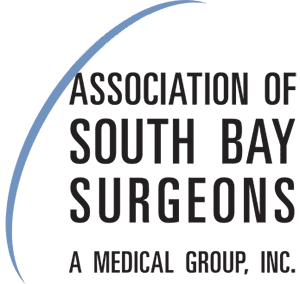 The surgical specialists at the Association of South Bay Surgeons have extensive experience and advanced training to take care of patients with these diseases. All the specialists you need, in your own back yard!